← Where Are Movies Made? I was once surfing around the cable channels when I came upon a screen that was almost completely white. Almost, but not quite – slight ripples and whorls were moving slowly across it. There was hardly any sound, just a hiss and occasional beep. It was hypnotic. The patterns were subtle but somehow familiar. I watched for five minutes before a voice came on. “Houston, we’ve finished the check of the unit.” It was a live feed from the Shuttle as it flew over a cloud-covered Earth! In the spectacular new movie “Gravity”, the Earth is very much a character. 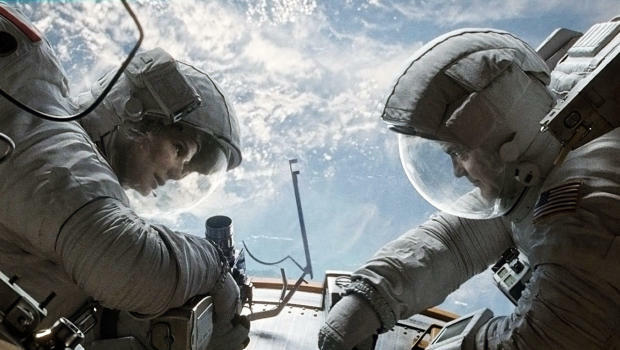 There are only two people in it, Sandra Bullock and George Clooney, playing astronauts stranded when a disaster destroys their Shuttle, but behind them and always beckoning to them is Earth’s huge and beautiful disk. It’s home, it’s safety, and it’s other people. The horror in the movie is to be floating in free space, helpless and alone. Beneath you, though, are millions of people. Look, there’s Cairo and the Nile valley. There’s the boot of Italy. At one point Clooney says “You should see the sun on the Ganges; it’s amazing!”, even though he’s in the most dire of circumstances. Space, though, is lethal. All of Low Earth Orbit becomes uninhabitable when a cloud of debris from an exploding Russian satellite starts destroying everything else in orbit. This has long been an actual concern. In 1978 NASA scientist Donald Kessler noted that debris from one satellite could create more debris when it hit another, causing a runaway cascade now known as the Kessler Syndrome. Small incidents have already happened. In 2007 the Chinese tested an anti-satellite missile on one of their own satellites, and created 2300 pieces of debris more than an inch across. It damaged the Russian BLITS satellite in 2013. The ISS regularly moves to avoid debris, and its occupants have had to retreat to a relatively safe part of the station, the Soyuz capsule, three times. So in this movie, the prospect of space is gone. Nothing can survive up there, manned or not. There won’t be any more space stations. The only hope is to get back to Earth as soon as possible. But that’s OK! Every frame of this movie says that Earth is where we belong. That’s not exactly the final frontier! The moviemakers could have made a point of showing the cleanup, the new missions, the refusal to be beaten by a mere accident. Not in the 2010s. People here are retreating from space and not going back, because they don’t belong there. Now, don’t let this dissuade you from seeing the movie. It’s gripping and gorgeous, and Bullock turns in the performance of her career. It was also nice to see people getting a grip and solving problems. So this parachute harness is stuck? We’re going out there with a wrench to undo it, in spite of the debris flying by. It’s also finally a justification for 3D – the way things are floating around immerses you totally in the story. Yet I found its underlying theme dismaying. Earth is not our only home, any more than the savanna was. Most of the Earth is pretty lethal to us naked apes, but that hasn’t stopped us. I regret seeing this much skill and art devoted to a story of retreat. This entry was posted in Uncategorized and tagged sf-ish, space-ish. Bookmark the permalink.